A hard plastic toilet seat can be extremely uncomfortable if you or a loved one are in pain, recovering from a surgery or just need some extra cushioning when sitting. 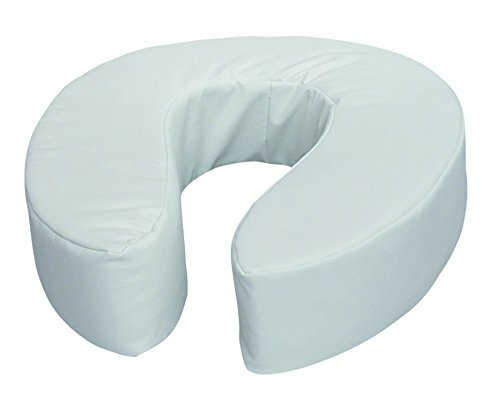 A cushioned toilet seat riser can provide needed elevation and padding in a pinch. Take a look at some of our top toilet cushion riser picks and scroll down further to read our review of the top pick, the ﻿Duro-Med 4 Inch Toilet Seat Cushion. The Duro-Med foam toilet seat cushion is a wipeable, tear resistant toilet riser with a white vinyl cover. It comes in 2 and 4 inch heights. It uses velcro hooks and loop straps to secure onto the toilet seat. It will easily fit most standard-sized bathroom toilets. Most users find that it is comfortable and soft with its 4 inch height generally deflating to about 2 inches of elevation. There are some users that have not had success with the 2 inch version - complaining that it deflates. We recommend purchasing the 4 inch option to avoid that issue. We should also take care to note that it will decrease the size of the toilet opening receptacle a bit- so don't be caught short by that! We've found that there are some mixed reviews for these toilet cushion risers as a category of product mostly because people have tremendously different needs. Since they are relatively cheap, and returns are easy through Amazon, it might make sense to take the plunge and try it out, returning it if it isn't a fit for you or a loved one. Customers with fibromyalgia, endometriosis, back pain, spinal fusions and other medical issues looking for bathroom comfort aids find that toilet seat cushion risers are an effective way of adding comfort to their bathroom experience. Some users found it difficult to attach the toilet cushion riser to their toilet, but in most cases it was because their toilets were non-standard. Many children of older parents living in assisted living communities purchase toilet seat cushion risers and other bathroom comfort products to help their elderly relatives to be more comfortable and fulfilling life. Besides just the elderly, many people that are having surgery, or have had a surgical intervention, or are just afflicted with a temporary medical malady will find that these are handy interim solutions. They are cheap enough to buy and dispose of after several weeks of use. 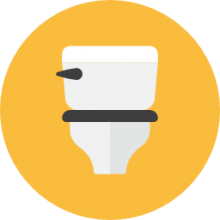 The most common problem that people have with these products besides general issues affixing them to their toilet seat lids is that the cushions will deflate and become flimsy upon sitting. This is why we recommend getting the 4 inch version so that when sitting there is still enough cushioning left to minimize pain on pressure points. You can also use them with portable toilets- handy if go camping or on RV trips. If you are looking to purchase a padded toilet riser, consider getting a 4 inch version. Also read the reviews on this page to get a sense of what would best fit your needs. Purchasing front and the retailers like Amazon is a smart option because of the free shipping and easy return process should you need to exchange your item for a better option.